Greetings again from the darkness. HEARTS OF DARKNESS: A FILMMAKER’S APOCALYPSE was released in 1991. It was an incredible documentary that explored the struggles of Frances Ford Coppola in making his classic film APOCALYPSE NOW (1979). Although it’s totally unrelated to either of those films, this latest from director Milcho Manchevski kept reminding me that we rarely get a peek at just how challenging it is to complete a film, and HEARTS OF DARKNESS is likely the cream of the behind-the-scenes crop. Director Manchevski directed the Oscar nominated BEFORE THE RAIN (1995), and he, along with co-writer W.P. Rosenthal, deliver an indie-film societal commentary with some not so complimentary observations on certain segments of our populace. Producer Kate (Sarah Goldberg) and director Trevor (Will Janowitz) are in a relationship and are trying desperately to make their name with a documentary that can play film festivals. While filming in a homeless shelter, they stumble upon a woman who calls herself Bikini … a homeless African-American Army veteran who is desperate to get her daughter out of the social services system. 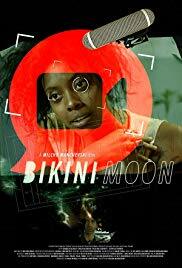 Bikini (Condola Rashad) is a striking, volatile woman with a story – the perfect subject for Trevor and Kate’s documentary. It takes a while for us viewers to get the rhythm of the film. We are watching as a documentary crew attempts to make a film about a woman who may be delusional or bipolar, and at a minimum is a bit unstable. Bikini admits to a nervous breakdown while in Iraq, and is inconsistent remembering to take her medication. However, in her moments of clarity, we recognize her exceptional intelligence and charisma. At other times, we worry about the safety of her and those around her. We even question whether she actually has a daughter and how much of her story we can believe. While coming to grips with the presentation and what to make of Bikini, we also have to adjust to Trevor, an obnoxious jerk who only cares about making his film – and is willing to exploit Bikini (or anyone else) to get it done. At the opposite end of the spectrum is Kate, who has a heart of gold, even at the expense of reality at times … she’s the stereotypical modern day liberal extremist who wants to save everyone and everything. It’s the only way she knows to rid herself of white guilt syndrome. Cinematographer Joshua Z Weinstein (director of MENASHE) works wonders with the tight residential quarters as well as the numerous urban settings from the streets of New York. Ms. Rashad, whom many will recognize from “Billions”, delivers a powerhouse performance as Bikini, though it’s a bit of stretch to see someone with movie star looks pulling off the role of someone living on the streets. Cynicism is present throughout, and director Manchevski really wants us to question what is ‘truth’ … what happens when the media crosses the line and influences the story … what is the real story? This entry was posted on Thursday, October 11th, 2018 at 10:47 pm and is filed under Drama. You can follow any responses to this entry through the RSS 2.0 feed. You can leave a response, or trackback from your own site.